Galena ore, the main source of lead was first discovered at Lin Ma Hang in around 1914. As described in Part 1, a number of attempts were made to commercially exploit the lead ore, but they all failed. 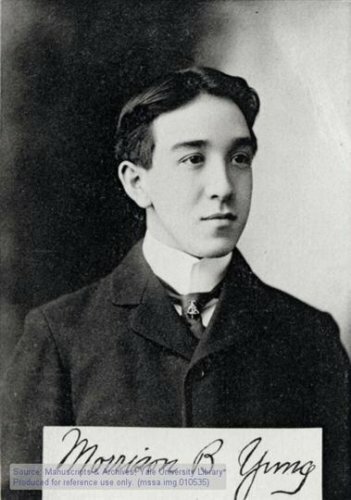 That was until Mr Morrison Brown Yung took an interest in the site and introduced modern mining methods to extract the lead ore.
Mr Morrison Brown Yung ( 容覲彤) was born on the 10th June, 1876 in Avon, Connecticut, USA to Mr Yung Wing, the first Chinese student to graduate from an American university, and Mary Kellogg, a teacher who came from a prominent Connecticut family. 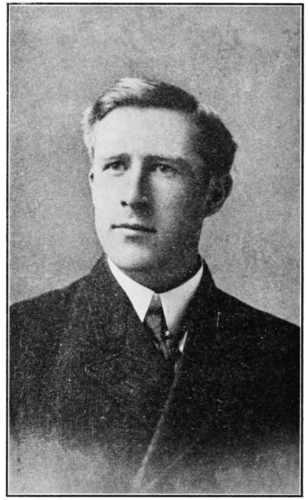 The younger Mr Yung attended Yale Sheffield Scientific School, graduating in 1898 in mining engineering and also from Columbia University in 1901. In 1909 he moved to Hong Kong and as a Eurasian, circulated within both western and Chinese communities. On the 9th March, 1911 he married his fiancée, Miss Ada Lylian Quinn of 5 Arbuthnot Road in St John’s Cathedral. In 1912, Mr Yung became the Chief Engineer for the reconstruction of the city of Hankow, and was subsequently appointed by Sun Yat-sen to be the head of the Canton Coal Bureau in 1920. In the following year, 1921, he drafted the first Chinese Mining Bill and set the blueprint for the development of the mining industry in China. He undertook mineral exploration in various places including Longyan in Fujian Province, Luofu Mountain in Guangdong Province and Guixian County in Guangxi Province. Following the death of Mr Sun Yat-sen in 1925, Mr Yung formed and became the chairman of the Asia Coal and Briquetting Company Limited, based in Hong Kong and Shanghai. His wife died in January, 1929 and was interned in the Chinese Protestant Cemetery at Pokfulam. Mr Yung later re-married Jong Sun Liang, known as Violet, who bore a child, Francis Morrison Yung, born 10 days after his father’s death. 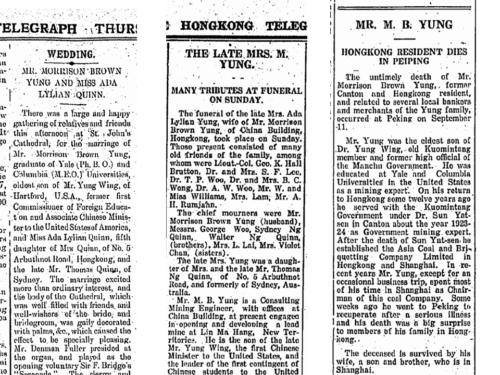 Mr Yung died in Beijing on the 11th September, 1933 at the age of 57. He was there to recuperate after a serious illness. His death was a result of lung disease, possibly related to the long exposure to the dusty environments found in the mines he operated. The Lin Ma Hang mine had been worked by a number of parties and all failed to develop a commercial operation. On the 20th September, 1924 Mr Yung wrote to the colonial Government requesting a Mining Lease for the Lin Ma Hang mine and a site visit was duly arranged. In December, 1924 Dr M Y Williams, of the University of British Columbia was visiting Hong Kong, studying the geology of the Colony, as research for the preparation of the first geological map and report. The map was published in 1936 and the report, after being lost in the Pacific War, was completed by S G Davis and published in 1952. Dr Williams visited Lin Ma Hang and prepared a report concluding that “the mine is scarcely worth developing”. After some discussion, Mr Yung requested a Mining Licence rather than a Lease and on the 18th December, 1924 the Governer in Council granted Mr Yung a 12 month Mining Licence for the 150.14 acre site. In March, 1925 Mr Yung proposed to invest HK$50,000 in the mine, but the Government was nervous based on the negative report from Dr Williams. It was agreed that this report would be released to Mr Yung to see if he would continue with his investment. Mr Yung read the report and confirmed that he wished to apply for a Mining Lease. This was approved by the Governer in Council on the 10th April, 1925. However, there was a problem with the lease conditions and Mr Yung requested additional minerals to be included. Thus, on the 23rd June, 1925 the revised Mining Lease No 3 was granted to Morrison Brown Young for 75 years and back dated to the 12th July 1922. It is not recorded why the lease was backdated. The original lease on the mine was issued on the 28th August, 1918 to Sir C P Chater. His company became insolvent in July 1921 and the lease was then sold on by the liquidator. The new owners did not invest in the mine and undertook no work, and thus, the Government re-entered the site on the 26th April, 1923. It is likely that the 12th July, 1922 represented 12 months of new ownership, at which time the re-entry criteria “no bona fide work was undertaken at the mine for a period of 12 months” was applicable. The Mining Lease required the payment of an annual rent of HK$2 per acre, or HK$302 in total, and a royalty to be fixed each year by the Governer in Council of no greater than 5% of the estimated market value of the ore. This requirement was later to become an issue as no value was ever set as it was just assumed that 5% was the royalty. 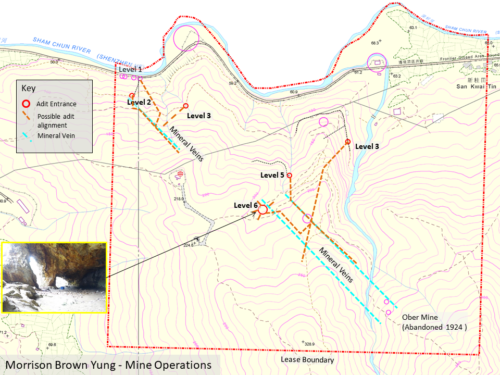 With the Mining Lease in place, Mr Yung started to develop the mine. By January, 1927 the mine was generating around 1500 bags of ore, each weighing 40 catties or 36T per month. The adopted method of accounting was to record daily the number of bags packed into a Chinese account book. The bags would then be weighed and transported to the Fanling KCR station where they were weighed again. When sufficent number of bags had accummulated, they were then sent by train to Kowloon for shipment overseas. This approach was open to manipulation and there was concern that given the location of the mine, i.e. directly next door to China, the Colonial government may not be getting its dues. In January, 1927 the District Officer, Mr J A Fraser, along with Dr R W Brock of the University of British Columbia who was engaged on a geological survey of the Colony, visited the mine and inspected the accounts. Mr Fraser concluded that; “From my inspection of the mine and its accounts, I think that Government’s interests are at present safe in the hands of Mr. Yung, but whether he should be allowed to contiune to take vague personal responsibility is a matter of doubt”. The output from the mine covered the operating cost but there was no profit to purchase new mining machinery. This was a concern to the Government, as it was the Colony’s only working mine, and so it was in its interest to encourage continued mine development. The report by Dr Brock was generally positive and recommended that the 5% royalty be suspended with the money being invested in the development of the mine. This approach was adopted in Austrailia where three years of royalty free operation was given to all new mines. Mr Yung’s finances were not in good health. Of his initial capital of HK$9,000, 75% from him and 25% his partner Mr J Heller, he now only had HK$2,000 cash in hand and owed $12,000. His monthly expenses were HK$3,000 which he covered by selling 12T of ore to the local market at a discount. As noted by D W Tratman (the Clerk of Councils) in May, 1927; “The bulk of the ore now being produced will not be marketable unless treated in a crushing plant which will cost HK$30,000, which is a sum he cannot hope to raise until he is assured of sufficent ore in the mine to make the success of the plant reasonably done”. To help with the development of the mine, Mr Yung order a compress and drilling equipment at a cost of HK$5,000, and this was delivered to site in October, 2017. He built a shed for the drilling plant and at the same time replaced the mat-shed labour quarters that had been destoyed during a storm. With royalties based on 5% of the mine, he owed the Government HK$1,427.89 for 1926 and HK$1,401.41 for 1927 and 1928. Given these outstanding fees and the difficult financial condition Mr Yung found himself in, a policy of remission of the changes was adopted by the Government until the mine’s finances were in a better position. By March, 1929 Mr Yung sought permission to erect a mill to process the ore and with a tailings dump. He stockpiled the ore at the mine as it was not economical to mill it by hand. He had 6,000 tons in place and once he reached 10,000 tons he would install the mill. Once the material was milled, the value of the royalty charges could then be assessed. By June, 1929 Mr Yung suggested an alternative approach to the royalties. Rather than pay 5% on the output value, he proposed 3% on the ore profits, allowing him to cover the cost of the capital outlay. Mr Yung demonstrated that the 5% royalty on the value of the ore worked was the equivelent of 25% of his net profit, making no allowance for interest or capital depreciation. This was eventually recognised by the Government and on the 2nd September, 1929 the Governer in Council reduced the royalty to 1% for three years and wavied all royalties prior to 1930, subject to a sum of not less than HK$5,000 being invested during 1930 on mining and milling plant. In 1929, the Great Depression spread from the United States and started to impact the world economy. The price of lead dropped from a peak in 1929 of HK$610 per ton to around HK$280 per ton in 1932. In this environment, Mr Yung was unable to get funding for the mill and requested a one year extension on the installation of the milling plant, hoping the price of lead would recover. The extension to the expenduture date was granted by the Governer in Council on the 11th August, 1930. However, mineral prices remained low with no further investment was made in the mine, and all work was subsequently suspended. With the death of Mr Yung in 1933, the mine remained moribund as a result of the low mineral price. It was not until March 1936 when lead prices had recovered that there was a sudden interest in the mine. Within a few days of each other, two parties paid a visit to the District Office seeking permission to re-open the mine. A Mr Wong Kin Kee of Foo Wa Mining Co accommpanied by his mining engineer Mr Purves claimed that they had the mining rights and wished to purchase land to erect crushing machinery to export the Galena to Germany. A day later, Mr Francis W Kendall and John Francis Manning, a mining engineer called in on the District Office and claimed to be the bonafide party to deal with the purchase of the land and not Mr Wong and Purves. Neither were named share holders in the mine. This meeting did raise the issue of ownership and royalties; this initiated a review within Government. Mr Yung’s lawer was Mr Quinn of Messrs Hall Brutton & Co and was also Mr Yung’s brother-in-law. When Mr Quinn was asked about royalty payments, the records state “but he is affected with the vagueness which seems inherent in this matter.” The Crown Solictor, Mr T M Hazlerigg, reviewed the case and concluded that in accordance with the Prospecting and Mining Regulation of 1906, the Governor in Council had the responsibility to set the royalty each year, and he concluded “I am inclined to think that as no royalty was fixed none would be payable, and the Crown would be entitled to nothing but Crown rent”. 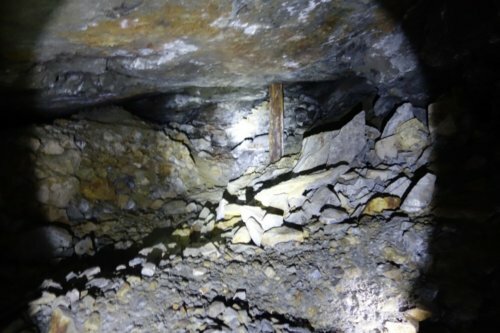 With the death of Mr Yung, the option to re-enter the mine was discussed but there was no obvious reason to do so. 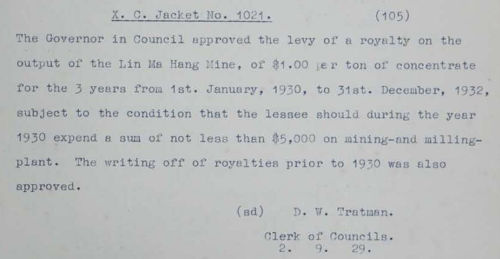 With no fixed royalty, they could not re-enter on the basis of lack of payment, the Crown rent was upto date following the payment of the current year rent by Mr Quinn in March, 1936, and there was no evidence to demonstrate that the mine had not been worked since December, 1930; a suitable reason for re-entry if no work had occurred over a 12 month period. To demonstrate that the mine was still operational, 30T of ore was sent off the site in April, 1936 demonstrating that it was still a going concern. When clearing Mr Yung’s estate, his shares in the mine along with the other shareholders were sold to Hong Kong Mines Ltd for US$100,000 on the 18th March, 1937. With lead prices once more on the rise, the new owner immediately set about re-starting the mine and installing the necessary processing equipment to make it profitable. On the 2nd July, 1936 the Governor in Council set the royalty for Mining Lot No 3 at 5% for the years ending 28th June, 1936 and 28th June, 1937. Thus, addressing the previous deficency. Prior to Mr Yung, the previous owners had developed the Level 1 adits, next to the boundary road and workings high on the hillside. All the mine’s records were lost during the Pacific War, but we do know that with the delivery of the drilling equipment in October, 1927 development work commenced on two levels. 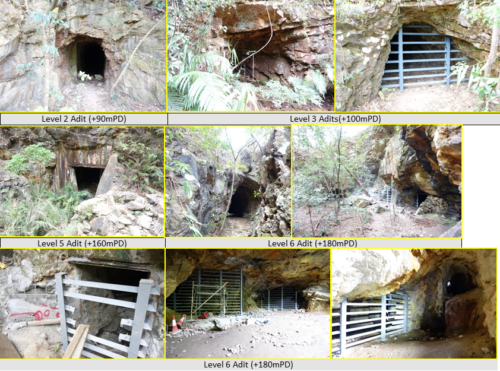 Based on the description in a file note of Feburary, 1928 it seems that mining commenced at the Level 5 and Level 6 adits, the latter being the popular cave feature (There was no level 4!). The notes describe exploration being undertaken; “in differet direction from a point more or less central”. In a report attached to a letter dated 26th January, 1928 Mr Yung describes the mineral vein “The width [of the vein] varies from 6 to 15 feet [1.8m to 4.6m] and the principle gangue mineral is Quartz. The important economic mineral is Galena carrying silver in the proportion of one ounce of silver per ton to every three percent of Lead”. He goes on to note that 2,000 ft or 610m of adits had been driven “resulting in the discovery of an important ore body, the dimension of which are not yet determined, and the incidental production of 376 tons of picked ore averaging over 60% lead and 20 ounces of silver per ton”. Much of the ore could only be seperated from the quartz by fine grinding and floatation, and hence Mr Yung’s need for a small processing plant. Before the suspension of mining activities in 1930, around 2,150m of tunnels had been excavated through “six ore roads”. Based on this information, I have tried to recreate the main working areas and to identify the main access points. Details of the Level 1 entrances are given in Part 1 of this article. In 1929, Mr Yung estimated that the mine had at least 50,000 tons of ore in the ground. 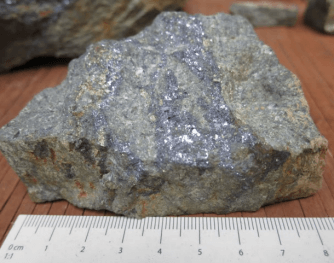 During the eight years of his ownership, it is estimated that the mine generated 20,000 tons of ore and produced around 3,200 tons of lead concentrate and 48,000 ounces of silver. Given the current growing popularity of the area, the Government is now fencing off the most popular workings to prevent unauthorised access. There are exposed shafts and unsupported workings and these should not be entered. One assumes it will only be a matter of time before all access is prohibited. 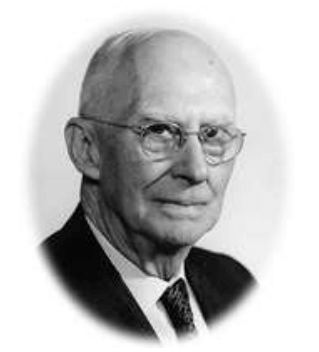 Morrison Brown Yung was the man that developed the mine at Lin Ma Hang, setting the scene for the commercial explotation of the mineral ore. In Part Three, I will explore the production and methods adopted by Hong Kong Mines Ltd and their Chairman Mr L R Nielson to work the mine. This article was first posted on 30th January 2018.